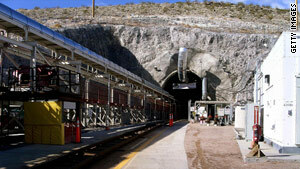 The Obama administration opposes storing nuclear waste at Nevada's Yucca Mountain site. Washington (CNN) -- A government-appointed commission will start reviewing Thursday ways to permanently store the United States' nuclear waste. The Department of Energy's Blue Ribbon Commission has been given the task of finding an alternative to the Yucca Mountain site in Nevada, which President Obama has vowed to close. The government has spent nearly $10 billion studying the Yucca Mountain location, and the Obama administration estimates that ending the program will save $197 million in 2011. It is highly likely that the 15-member commission will abandon the option to store nuclear waste at Yucca Mountain. It is expected to take 18 months for the commission to conclude its findings, and that isn't sitting well with several lawmakers from states with temporary nuclear waste storage sites. House members Tuesday introduced a bipartisan resolution to block the closure of Yucca Mountain, according to media reports. Rep. Jay Inslee, D-Washington, said the resolution calls on the Department of Energy to follow the will of Congress. "Keeping waste scattered across the country, or in the case of Washington State at Hanford, is no longer an option," Inslee said in a statement. "We have a solution to this problem and we must move forward." After uranium has been used in a reactor, the spent fuel remains radioactive for thousands of years. It is taken out and put into a pool of water, or above ground in canisters made of concrete, steel and lead. There's never been a plan B. The Nuclear Regulatory Commission says the canisters are certified for up to 90 years of use, but that term may be extended. Both supporters and opponents of nuclear power largely agree that storing the material in casks at nuclear plants is no long-term solution. If the blue-ribbon commission decides to abandon Yucca Mountain as a nuclear storage facility, there are concerns in southern Nevada over what will be done with the site. "For years, there's never been a fallback, there's never been a plan B," says Michael Voegele, who's been involved with the Yucca Mountain project for decades. Voegele, a consultant with Nevada's Nye County, says it was "only recently" that people began to discuss other possible uses for the site. The search for future uses of Yucca only came into question, according to Voegele and others, when the Department of Energy filed a petition to withdraw its Nuclear Regulatory Commission license application for Yucca Mountain earlier this month, effectively killing the project. The Department of Energy filed its petition to withdraw the license application with prejudice, which would prevent it from being refilled. Senate Majority Leader Harry Reid of Nevada has fought hard to end the Yucca Mountain project, which is unpopular with many Nevadans. He has asked the Government Accountability Office to consider alternative uses for the site. Those alternatives include national security activities and renewable energy research. But the closure of the project could have a major economic impact in the region. Gary Hollis, the chairman of the Nye County Board of Commissioners, says closing Yucca Mountain slams the door on 4,000 construction jobs and about 1,500 permanent jobs that would have been created if the site ever got up and running. CNN's Brian Larch, David Mattingly and Dugald McConnell contributed to this report.